Senchyne researches and teaches the history of the book and print culture in early and nineteenth-century America. This work also touches on work in American studies, American literary history, critical theory, material culture, digital humanities, library history, and archival theory and practice. 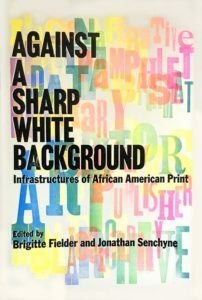 Against a Sharp White Background: Infrastructures of African American Print is available for preorder! The work of black writers, editors, publishers, and librarians is deeply embedded in the history of American print culture, from slave narratives to digital databases. While the printed word can seem democratizing, it remains that the infrastructures of print and digital culture can be as limiting as they are enabling. Contributors to this volume explore the relationship between expression and such frameworks, analyzing how different mediums, library catalogs, and search engines shape the production and reception of written and visual culture. Topics include antebellum literature, the Harlem Renaissance, the Black Arts Movement; “post-Black” art, the role of black librarians, and how present-day technologies aid or hinder the discoverability of work by African Americans. Against a Sharp White Background covers elements of production, circulation, and reception of African American writing across a range of genres and contexts. This collection challenges mainstream book history and print culture to understand that race and racialization are inseparable from the study of texts and their technologies. “Paper Publics and Material Textual Affiliations,” University Seminar in Material Texts, Columbia University, October 5, 2017. “Type, Paper, Glass, and Screws: Reading Surfaces and the Materialities of Communication,” Ph.D. Program in English Friday Forum Series, CUNY Graduate Center, November 3, 2017. “Slavery and the History of the Book in America,” Program in Book History and Print Culture, University of Toronto, Ontario, Canada. March 1, 2018. “Historicizing Digital Humanities: Bibliography, Data Cultures, and Reading” Advanced Research Collaborative Seminar, CUNY Graduate Center, March 8, 2018. “Type, Paper, Glass, and Screws: Reading Surfaces and the Materialities of Communication,”: Brown Bag Lunch Talk Series, Bard Graduate Center in Decorative Arts, Design History, and Material Culture. March 12, 2018. Visiting Faculty Member, “The Book: Material Histories and Digital Futures,” NEH Summer Institute for College and University Teachers. Salt Lake Community College, Salt Lake City, June 18-July 23, 2018. “Genealogies of Black Modernity in the Long Nineteenth Century Symposium” American Literary History and Trowbridge Initiative in American Culture, University of Illinois Urbana-Champaign. April 5, 2019.